This month I must have cursed the weather a million times as it seemed to rain on me every time I ventured out and theirs nothing worse than venturing out the following day with soaking wet tackle. Numerous times the weather forecasters have got it completely wrong, unable to keep tract of the ever changing wind direction and although I now head out expecting the worse it still gets to me as reading a water with a variable wind is difficult to say the least. I always thought that during the winter the predominant wind was from the east and in spring it shifted to the south west yet over the last six months it’s been completely the opposite. Having said that, looking back at the images compiled over the last month it all seems well worth the effort with at least one massive fish being landed, however this ones not appearing in this months round-up as its with Anglers Mail as we speak (keep an eye out) but lets just say, when you least expect something special it happens and sometimes in the most unlikeliest of places! Looking at the diary inputs it’s been what can only be described as a varied month. I was surprised to see that I’ve only been bankside sixteen times this month, as it seems so much more, but the ever relentless feature writing behind the scenes has pretty much filled the month up. The sessions have totalled nearly 140hrs, so well up from previous months and have been split between guiding (6), features (4) and personal sessions (6) yet on a number of the guiding sessions customers have wanted me to fish alongside as watching is often a great way of learning and it was on one of these sessions that well what’s classified as a Fox/Drennan fish was landed. Without going into too much detail, this month should have seen a considerable time spent targeting tench, yet just like last year I arrived at my chosen lake to find the venue closed due to the carp spawning. The club book states that this venue will close due to this ritual for two weeks, yet in my mind the 19th May is a bit premature, yes they may well have started showing signs of spawning over such a hot weekend yet the following week was damp and cool. My feelings are that the lake will have to close again for far longer than the two week stated period and if it does, well if you see me with steam coming out my ears you will know why. I’m a tench angler so why should the bloody carp dictate when I fish the venue? It’s a mixed fishery guys! Apart from the massive crucian, opps, the most remarkable session was spent with Alan Chadbone, a disabled angler that just inspired me and will you when you read the Action Replay that will appear in Anglers Mail very soon. Another was a session with my mate Chris when we decided to target grass carp with a baitboat that hadn’t been used for around six years. In short, the batteries failed twice whilst in the middle of the lake and on one occasion I found myself landing a 4oz lead a few feet over it to retrieve it. It was only when we got it in that Chris said the boat cost him around £700! Martin, one of my customers had joined us and landed his first grass carp only for me to watch as it swam out of a draping draw string whilst trying to retain it, however he did land another later that day. On the same day I decided to use my 9ft Nash Scope rods and found myself locked in battle with a daytime catfish as well as a couple of grass carp and a mirror, all to the particle approach. Certainly a day of mixed fortunes but one that was never boring. Broadwater has been all over the place, one day fishing well, the next badly. One customer took 22 carp to over 19lb including a goldfish of 2lb 9oz, on another two of us struggled for eleven carp with Martin catching the lakes golden Kio and on another day we struggled for just two carp. One session at Badshot Lea big pond saw my mate Chris chucking out a rod for cats and the proceeded to land five, all between 18lb and 33lb as well as a 14lb grass carp and an 11lb mirror. I kept to the particle approach and managed my target species a grass carp of 18lb 8oz plus a stunning 18lb mirror yet whilst the night was hectic the day was dead. An eel session at Sumners Ponds at Barns Green near Horsham was one to remember as numerous runs throughout the night resulted in three modest eels. It was one of those text book sessions and we really should have banked a few more, yet it was our first session on the year and, well mistakes are made but its really got me fired up to spend more nights targeting this ever raring species. Although the months not over, I'm of to Broadlands this weekend for a Nash Roadshow. Last year was brilliant with loads of anglers attending and fish caught, mainly of the surface, so if you’re at a loose end and want some entertainment then come down and see us, you won’t be disappointed! 1. Fun on a 9ft Nash Scope! 2. How red can it get, personal best goldfish from Broadwater. 3. The orange Kio from Broadwater, what a stunner. 4. Proof that being stereotyped can cost you fish. Chris with a 33lb cat part of a red letter catch. 5. My rare stereotyped approach was finally rewarded with this 18lb grass carp. 6. Look at the paddle on that! 7. The photographer even got in on the act at Sumners. Charman’s Challenge – Sumners Ponds. Tickets Adult day tickets from 7am to dusk cost £8-00 for 1 rod, or 2 rod £12, concessions apply for both juniors and OAP. Night fishing restricted to campers or full season members, more details available from Alan the onsite bailiff. Tel 01403 732539. Sumners Pond – Carp to 34lb, perch to 4lb, chub to 6lb, bream to 7lb, roach to 2lb plus rudd, pike to 15lb and eels to 6lb. Farm Pond – Carp to 24lb plus the above species Inc crucians. Match Lake – Barbel, chub, carp, crucians, bream and roach. Ribbon Lake – Tench, chub, barbel, bream, crucians and silver fish. Conditions – Drizzle on arrival soon passing leaving a warm night with temperatures holding up at 12degrees, A/P on 1016mb and the horrid north east wind easing. I first acquainted myself with Sumners Ponds Fishery and Campsite around six years ago. I was asked by Anglers Mail to shoot an Action Replay feature with the brilliant Steve Saunders who was targeting silver fish on the pole. It turned out to be a fantastic day and when someone mentioned that the venue contained some big eels I left knowing that one day I would return with these in mind. A few years past when a venue was needed to supply a few bream and I forwarded Sumners as a contender. Once again the main lake never let us down and with my friendship with the fishery and especially with Alan the onsite bailiff I chanced at asking if I could do an overnight session to explore the eel potential. The first night was one I clearly remember as I was up all night striking run after run. Fishing king prawn on the hook five eels graced the landing net, the best a shade over 5lb. Since that first visit I have fished the venue a number of times, never out staying my welcome, maybe two sessions a year and always providing the complex with catch images as a thank you along with completing features for magazines such as Coarse Angling Today, Anglers Mail along with videos for both Tight Lines and OnlineFishing.tv. It’s a relationship that works both ways and I look forward to my pilgrimage to Barns Green each season knowing that I won’t be disappointed. Arriving at around 6pm Alan had secured a swim away from the holiday makers and come 7.30pm I had two king prawns positioned, one close to the island, the other close in. 9pm approached and with the light fading the first run developed, yet my hast to hook my first eel of the season saw the run missed as was the second a few minutes later. Expecting a hectic night things then slowed up and come 1am just as I decided to refresh the hookbaits both rods screamed of together. One missed but the other hooked and I was surprised after an angry fight to see a modest eel around 3lb in the net. Again that was it till dawn; however contra to what’s been written before I feel that first light is a prime time to catch eels, a time when the biggest often makes a mistake. Today was no different as at least six runs developed yet only one was converted, another three-pounder with three resulting in strange hook pulls. It was one of those nights when things could have been so much better yet with eel fishing missed runs are par for the course and knowing that the two eels caught were lipped hooked showed that they weren’t really having it. My tackle for the night included Nash Entity 2.75lb t/c rods with 35lb Nash NXT Bullet braid as mainline. Although I’m not a lover of braid, for eel fishing and pike fishing I feel it’s a massive advantage in seeing bites early and setting the hooks before the bait is dropped. End tackle was the ever reliable J.S Eel rig comprising of the same braid as a hooklink which is extremely abrasion resistant and a dam site cheaper than Kryston Quick Silver, a 1.5oz running lead and size 6 Nash Gaper barbless hook. I’m looking forward to a return very shortly, however before so I will be visiting the Match Lake for a bit of waggler fishing, a session that will appear in Coarse Angling Today later this summer. One of the three form last night’s session. Braid, a massive advantage when targeting eels. Ignore a king prawn at your peril, they’re brilliant. I always take two nets, a 50inch carp and a big Gardner barbel spoon for those difficult ones! The J.S Eel rig covers 90% of my eel fishing. Get your tactics right and the rewards will come. A couple of Sumners whackers. Helicopter Rig Sleeves – Their Nash! A couple of weeks back you will recall that I was getting frustrated with the small tapered anti-tangle sleeves that I had trusted in for a number of years when fishing the helicopter rig. I’d either bought a bad batch or the previous manufacturer had done some serious cost cutting and as a result the quality was to be polite, bloody rubbish. Fortunately whilst fishing with my mate Chris he found some different ones within his tackle box but wasn’t sure who made them. A couple of days later whilst fishing with Paul Garner he mentioned that he used Nash sleeves, obviously I had missed these whilst scrolling through the endless TT products they provide and quickly ordered a trade pack the following day. To say they have solved the problem of splitting both ends is an understatement as these little beauties stay in perfect form, session after session, so if your suffering the same frustrating problems then you know exactly what to ask for! Charman’s Challenge – MBK Barons Big Pond. Stock – Plenty of carp to over 20lb plus good tench, crucians and perch plus rudd and roach. Conditions – Atmospherics seriously high at 1034mb with no wind and a cold night down to 3 degrees but blue skies see temp rising to a high of 20. I’ve been slagging the bloody wind off for a number of weeks yet today was one that would have made all the difference as any ripple would have given us a fighting chance against what can only be described as horrendous conditions. My brother and friends even struggled at carp bagging venue Broadwater the day before so I wasn’t surprised when the usual instant response failed to materialise. Barons is similar to MBK Pump Station, great for disabled, juniors and elderly anglers with toilets and car parks close to the lakes and the plat formed swim, although not my cup of tea are well constructed and comfortable. I had been told that the lake had been fishing its nuts of recently, in fact one match was won with over 60lb of crucians, yet its bigger residents were my target and a few double figured carp was what I expected. Setting up halfway along the causeway I initially introduced five balls of pellets which were allowed to settle as I set up. During the summer the rules only allow one rod, the sport can be that hectic and my choice today was a 9ft Nash Scope, 10lb main line with a 1.5oz free running inline lead along with an 8lb mono hooklink and oversized 14 hook tied knotless knot style leaving a hair that would initially contain a 10mm Tangerine Dream Nash Instant Action boilie. Placing the rig within a half filled Nash Ballmaker I then filled this to the top, pressed the plunger and out came a perfectly formed pellet ball that I simply swung into position. Straight away it was obvious that fish were around as the rod tip constantly tapped and although this continued even after three more casts I just couldn’t buy a proper bite. Finally after around thirty minutes line started to leave the spool but somehow the first carp was lassoed by my hooklink. Introducing five more balls of pellet I left the swim to settle whilst having a cuppa and talking to dad who was on the next peg float fishing prawns. He had also landed a carp plus a few perch but wasn’t exactly bagging up. Back in my swim I swung another ball into position only to have the rod ripped from my grasp as the next carp fell for the new tactic followed by a tench and although the action was steady with modest mirrors and the odd tench throughout the morning the bigger carp just weren’t having it. Constantly changing hookbaits to try and find a winner failed to sort out the bigger fish and with the sun now high and temperatures rising I decided to cast further out. Five quick cast to get some bait in the swim then saw my rig falling over the top and straight away the spool leapt into life, this time from something slightly larger, a common around 10lb. I thought that I had found the solution as the next cast bought another carp somewhat smaller, however these two fish were all I could get from this spot and with dad having caught the odd carp early on but now being plagued by small perch we decided that it was just one of those days that whatever you try just isn’t going to work. Get the right day and either of the lakes will see fish crawling up the rods yet with a dying wind, cold night and bright sunny conditions, today just wasn’t the right one yet we still caught a few fish and its days like this that makes us all better anglers. Normally you can catch loads like this and bigger. There are loads of good tench and crucians as well. The new Nash Ballmaker allows the rig to be placed within. Press the other part into. 2mm pellets around the hookbait, what more do you want. Charman’s Challenge – Watmore Farm Fishery. Watmore Farm Fishery – Fox Lane, Eversley Cross, Hants, RG27 ONQ. Tickets Adult (up to 2 rods) £10-00, Concessions (up to 2 rods) £8-00. Stock – A mixed fishery, predominantly carp averaging 5lb (don’t believe everything you read!) but up to 20lb along with plenty of quality roach plus bream and tench. Conditions – Atmospherics constant on 1010mb, decreasing wind from the south west but still powerful, sunny with odd shower late on and temp rising to the mid teens. I’ve fished Watmore Farm on a couple of occasions in the past. One was with a client that wanted an introduction into carp fishing and although every tactic we tried from the method feeder to PVA bags caught, the method that stood out and caught the most fish were zig rigs. The second time was with a group of friends celebrating a birthday and once again the zigs stood out yet if anyone had fished the pellet waggler and got the carp going then they would have simply taken the place apart. Back then the fishery made you buy and use their own pellets, something that I detest, however the new owners Carol and Andy don’t insist on this which is encouraging as anglers pockets are only so deep! The reason for my return was due to shooting an Action Replay feature for Anglers Mail which every angler needs to read as it’s simply inspirational. I can’t tell you anymore but keep buying your copy every Tuesday as it will be featured very soon. Fortunately the weather stayed dry, well almost and come early afternoon, and with the feature all sorted I decided to stay on and give the pellet waggler a go. I must have looked a bit strange, perched on top of my match style tackle box dressed in Nash clothing, yet it had to be done as if you are going to give this method a go then you need to be organised and have everything to hand as feeding is the key to catching. The tray to my side contained my bait that consisted of a bag of Nash Instant Action Tangerine Dream 6mm High Attract Pellets along with a couple of sticks of Peperami, one spicy, one original. The Peperami would be punched into 6mm pellets and hair rigged whilst the pellets fed around the float to get the carp going. The reason for using the Peperami on the hair is that it withstands, not only the constant casting needed to get the best from the swim but also stays on the hook even when playing a fish and is so less fiddly that using bait bands and the like. My 13ft Carbonactive rod I have to admit to being a bit under gunned for this type of fishing but as I only indulge in this method, maybe twice a year buying a purpose built rod seems a bit extreme. Gardner 6lb HydrFlo main line is great for this robust style of fishing and with a 8gram Dura-Pellet Wag, Reflo 5.14lb hooklink and a size 18 barbless PR36 tied knotless knot style completed the set up. Now you maybe thinking that a size 18 is far too small but this pattern of hook is seriously oversized so is more like a conventional 16 going 14! The Preston Dura-Float I have to admit to having mixed feelings on as although they cast like a dream and have brilliant colour changeable tops the brass weight tends to unwind during a fight so you need to make sure this is tight every cast otherwise you will loose the float as I did on the third carp. Fortunately I had the wind in my face and the float drifted in but I would personally recommend you take of one of the weight adjusting washers and then glue these items together. All the time I was setting up, probably around twenty minutes in total I was catapulting around ten pellets out as often as I could in the hope of gaining the carp’s confidence and getting action from the off. In fact I had set myself a double barrelled target which was either how many fish I could catch from one bag of pellets or how long would it take to catch a dozen carp. Setting the rod rest so it was slightly off from centre I catapulted some pellets out, cast, then quickly sunk the line but before I could pick the pult up again the rod bent round and the clutch began to tick as the first carp slipped up. So what target was reached first, well it was twelve carp, time 1hr 40mins which included a ten minute break to avoid a torrential downpour. How many pellets did I use, not even half a bag, that’s 450g! How do I describe this fishery, fun, immaculate and friendly. I even found a pound coin in the car park and a complete Dura-Float in the margins, however beware, these carp are their own worst enemies and fight like hell, something that puts me off a bit, if you know what I mean. Ten or so pellets every ten seconds is the way to go. Can you tell the difference? The fish couldn’t! Pellet wagglers come in all shapes and sizes. Instant Action in more ways than one. Make sure you take more than one catapult. The biggest of a dozen but bloody good fun! Customer catch report - Hauling carp. Wet, wet, wet but still hauling. I have to admit fishing in the rain I can handle, fishing in the wind I can handle yet when it’s wet and windy it irritates me to bits; the only saving grace was that this session was at Broadwater and hopefully a constant string of hard fighting carp would take our minds of it. My customer today was a river fanatic that fancied a day getting to grip with carp. Chris had joined me for a pike session back in the winter and caught a personal best pike; well it was before I took the perch out of its throat and having a modest best carp of 12lb I was confident that this could be increased. Setting up in Peg 19 we initially went through the simple rigs that we would be using, everything scaled down which included size 12 hooks, 10lb braided hooklinks and small punched pieces of meat on the hook tipped off with a buoyant sight stop. It didn’t take long before a rod ripped off and Chris found himself attached to what turned out to be a new personal best carp weighing 19lb 2oz which was quickly followed by a mirror of 13lb 8oz. The action continued throughout the day, slowing after 11am yet come 6pm Chris had landed no fewer than 21 carp averaging 10lb! I even got in on the act as you can be sure at times both rods will go! In fact Chris returned home with two personal best as late in the day he dropped the net under a goldfish weighing 2lb 9oz. Oh and as for the rain, well although it fell down all day we hardly noticed it. Martin eventually got his picture! One of my regular customers was interested in joining myself and fishing companion Chris Petter for an experimental first trip targeting grass carp. These trips are to iron out ant creases and believe me this one needed a good ironing! Arriving at Badshot Lea Big Pond at 7.30am the conditions weren’t exactly what we prayed for, overcast along with a chilly north east wind. Setting up along the railway bank our plan was to bait relatively heavily with particles and fish buoyant maize baits over the top. Chris had bought along his bait boat that hadn’t been launched for around six years so with three sets of old batteries fully charged we didn’t think that we would have any problems, yet after setting three rods the boat became motionless around forty yards out. After what seemed ages, hoping that this would drift in on the wind I decided to cast a lead over the top. Now with around six hundred pounds worth of boat and a two ounce lead being cast at it I could imagine what was going through Chris’s mind yet he needn’t have worried as first cast saw the lead land a few yards past and the line catching on its aerial. With new batteries fitted we managed to get Martins second rod out but the boat was still on a go-slow, yet as Chris tried to set his rods one of Matins sprung into life in true bream looking style. Knowing that grass carp often only give delicate bites Martin lifted the rod and sure enough what initially felt like a bream finally turned into a grass carp. With the carp safely in the net I arranged the camera and weighing equipment as these fish can be very active on the bank so being organised is very important, yet as I broke down the landing net the grass carp started to fight back and as myself and Martin watched, his first ever grass carp leisurely swam out of the net due to me leaving a great big opening in it. In a few moments Martin had seen angling at its best and worst and I embarrassingly reassured Martin that he would get another one. Chris finally got his rods out but due to the batteries looking a bit dodgy the two hour resetting of rods was increased to four. Martin then received another bite but momentarily felt the fish before the hook pulled before Chris was away. Having a personal best of around 12lb we watched as a big grass carp, probably a mid twenty come slowly towards the net and as we crouched down it swam past, probably in scooping distance before going on a powerful run resulting in the hook pulling. Chris was gutted and for a few minutes not a lot was said, it was just one of those days! Three hours past with little interest before one of my rods sprung into life, yet what was on the other end couldn’t be a grass carp as it seemed intent on stripping me of line. I was using my 9ft Nash Scopes and 10lb main, not exactly catfish tackle but that was what was on the other end yet gentle persuasion finally saw a sizable catfish drop into the net, one that weighed 15lb 12oz. The second battery had now died but the third, a smaller set seemed to be full of life and this rod was reset in record time only for it to rip of again a few minutes later. Once again the initial run told me it was our target and moments later a double figured mirror dropped into the net. We were beginning to wonder if a grass carp would ever show but again my rod signalled a bite and finally a mid double grass carp saw the bottom of the net and the safety of the unhooking mat! Happy with three fish I allowed Martin to pick up the next run which again came on one of my rods and after a short fight he too landed a grass carp, one that was very similar to the one lost earlier so eventually managed to get his picture. Chris was still thinking of the one that got away yet seemed to be having the last laugh as towards the end of the session he was once again in and drawing a bream like fish towards him, yet just as he was thinking it would turn into a big grass carp a bream popped up on the surface. Another time my friend! Charman’s Challenge – Court Farm Fishery. Date – Thursday May 1st. Tickets purchased on the bank. Lake 1 & 2 – Adults £9. Lake 3 - Adult £11 (no concessions). Lake 3 stock – A good mixed fishery with lots of double figured carp, big roach plus tench, perch and bream. Conditions – why does it always rain on my days out on a day ticket water? Temperatures down to just 13 degrees, no wind of such, yet it feels good, humid and overcast. Court Farm Fishery is as many will know a venue that I usually target the carp on the float, yet I needed a water where I could experiment with the new Nash Ballmaker and this fished filled lake seemed the perfect place. A quick check of the rules prior to leaving home showed that boilies weren’t allowed which was annoying as I really wanted to try out the new Tandoori Spice 2mm Ballmaker Pellets in conjunction with the same flavoured 10mm Instant Action boilies. Looking in the freezer I found some curry spiced luncheon meat left over from an old barbel trip so this seemed the next best thing, however I later learnt that boilies are allowed as hookbait, but banned in any other use which seems a sensible day ticket ruling. Having dropped the girlfriend of at work I made my way to my parents to collect my father who fancied getting some fresh air before heading to the fishery at Aldermaston. Arriving I was surprised to see no other cars present, obviously everyone had seen the weather forecast and decided against it, and in a way I wish I had as I cannot stand fishing in boots, waterproof jacket and under a brolly. By the time we cast out it was well past 8am and within five minutes the rod to pulled round and dad was into a carp that somehow shed the hook. Tactics today were simple, 2oz inline leads fished bolt style with a foot of Nash Cling-on tungsten tubing behind and a 10inch 15lb Missing Link hooklink pinned down in two places using the brilliant Nash small Clingers before a barbless size 10 hook attached knotless knot style. Rods were carefully chosen as today was all about dropping the rigs just inches from the bank so it had to be my pair of 9ft Nash Scopes. H-Gun reels were loaded with 10lb Gardner HydroFlo keeping everything balanced and although I had a set of Sirens mounted on short Gardner So-Solid Sticks, in most cases I would be just placing the rods on the ground with the baitrunner on and waiting for them to spin. Watching the rod tips twitch constantly I was surprised that we had to wait a while for the next bite yet it wasn’t from a carp but a roach around the pound which was followed by a bream and a tench, not exactly what I was expecting. A couple of modest commons then came but these weren’t the doubles I was hoping for so we decided to move from the deeper water to the shallower end. Filling the Ballmaker half way before dropping the hookbait and hook within, then sliding the mainline down the slot in the side, before filling it to its level I simply inserted the other part and pressed down and out came a perfect ball, ready to be lowered in the margins. I didn’t have time to get the second rod set before the reel spun and another modest common graced dad’s net. A couple of things I noticed were that the pellets need to be of a certain consistency for the Ballmaker to pop out perfectly formed balls every time. Too sticky and they get stuck, too dry and they break in half, so be prepared to experiment on mix consistency when you first try this, however more importantly is that when filling the ballmaker, only fill it to its level. With the right consistency and keeping to its level you will be able to make perfect pellet balls with your hookbait placed within every time, a method that I can see being devastating on many a venue and not just for carp! With only three hours to spare and already seeing most of this fly by I decided to bait a spot right on the corner of the next swim in hope that a couple of better carp would think that an angler had just packed up and tipped a bit of excess bait down the edge. What I love about the knew ballmaker with the slot in, is that every ball introduced to your swim looks exactly the same, even the one with the hookbait within and with half a dozen balls dropped close in plus the one with my hook in I was sure a bite was immanent. 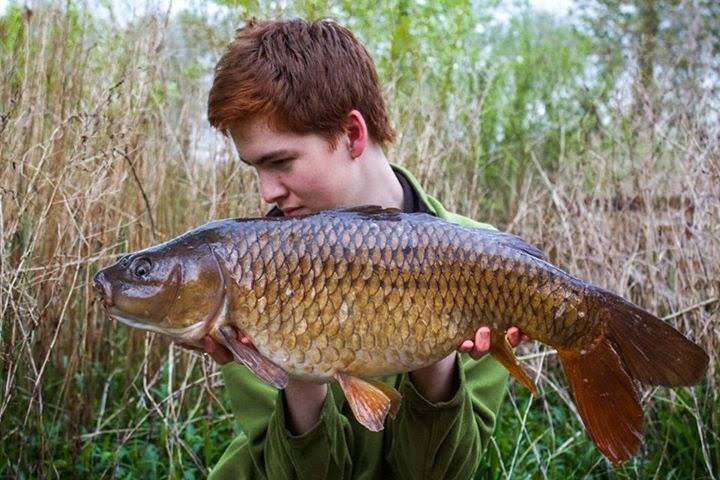 It was a tactic that transformed the session, albeit one I found too late as two better commons graced my net and I know more would have followed including the lakes bigger fish if I had found this out later. If your looking to find a venue that’s attractive, and quite, one that contains not just loads of double figured carp but the chance of a very big roach or perch plus bream and tench thrown in for variety then this is the venue. What I love about the specimen lake at Court Farm Fishery is that it lends itself to a variety of methods from simple float tactics in the margins with prawn over hemp being deadly to scaled down carp rigs like I used today as well as being a fantastic floater water and I suspect a brilliant venue for both the pellet waggler and zig rigs. To be honest today was just one of those days we all get from time to time, a day when something in the air makes even the easiest venue difficult. I would have expected six double in three hours here along with a few smaller samples but it wasn’t to be, however I know many a venue that most would have drawn a blank on today, yet at Court Farm you’re guaranteed at getting a bend in your rod whatever the conditions. Its been a strange month, usually one that I look forward too and relish as all fisheries wake up and their occupants go on a feeding frenzy, yet its had not only its high’s but its lows, the most life changing one being the loss of my good friend Richard Crimp. Richard was one of the founders of the TAC (Thames Anglers Conservancy), an avid Thames angler that loved the outside world, chasing monsters of the deep, namely carp but he also had a passion for perch. He was only 47 when he lost his fight against stomach cancer, an indiscriminate illness that once again took one of the nice guys. How do I describe Richard, charismatic, charming, a listener and one that was able to store information like no one I knew. He often helped me out when the hole was dug and was never condescending or offensive, explaining things in simple terms so that I understood. I will remember Richard for sleeping within his unhooking mat, at one with nature under a star filled sky, on the Thames in places we never should have been, the only sign giving him away was the smoke from his roll up, yet more than anything he was a gentleman and friend that will be dearly missed. RIP my friend. April is normally an unsettled one, one of sunshine and showers, warm days and chilly nights, yet what’s been most noticeable this month is the ever changing wind. Rarely has the wind direction been the same on consecutive days and it’s for this reason why the fishing has been so inconsistent. Usually I end the month on a high with a couple of whackers to show for my efforts, yet a big silver bream just hasn’t happened and I just cant see it happening, why, I don’t quite know, its just a feeling and having to give up Westhampnett due to the cost, but more importantly due to it being a non-publicity water the massive bronze bream hasn’t happened and probably never will. Things could have been so different if my hook hadn’t pulled from the mouth of a very big eel, yet this would have been an accidental capture, so although upsetting it wasn’t the end of the world. Looking at my diary inputs I’ve managed to get out on fourteen occasions, down on the last couple of months due to the rivers closing and short sessions being knocked on the head. In total these sessions have added up to 143 hours, an average of more than fourteen hours per session! Personal sessions (4) have been disappointing with guiding (6) days up and features (4) also up. My customers have all gone away happy, some with mega hauls of bream, crucians and tench and with at least one customer per week during May along with the weather warming up, and hopefully a wind that makes its mind up, things look good. My weekly day ticket challenge hopefully has been working out and providing readers with a few new places to visit with the best being compiled into a knew feature that will soon be published within Coarse Angling Today. The four venues this month have been Mill Farm Fishery, Harris Lake, Goldsworth Park and River Farm Fishery. Sadly problems with the water quality at River Farm Fishery has seen the venue close but even sadder is the quality roach it once held are no longer! The four personal sessions has seen me visit Mill Farm Fishery, fortunately before the doors open to the public due to my help with the fishery as a whole with features and catch reports, yet although over a couple of hundred pounds of fish were caught, the best silver bream taken was 2lb 3oz, one that I couldn’t count as my mate Chris took my rod whilst I played a carp. One day was spent with my father at Badshot Lea Big Pond were once again more than a hundred pound of fish were landed, all bream apart from two tench that dad landed. He enjoyed himself so much he even stayed on when I left! Another session was again spent on Badshot Lea targeting catfish, sadly without any joy and the other on a new tench venue that again was unproductive buts that’s all part of the learning curve. 1. Dad with a standard BLBP bream. 2. The best silver of the spring, shame I was playing a bloody carp. 3. Chris in action at dawn. 4. Young Tom with an old warrior. Watch out for this one, he’s good! 5. Alan in action at Goldsworth Park. 6. Its not all about fishing.